When the Linda Maguire Team offers to do staging for a client’s home, to prepare it for listing, it means doing whatever it takes. In this example, the seller clients had lived in the home for over 40 years, and although the home has great potential, there were many areas of the home that were showing significant wear. Linda and her team jumped in to not only bring in furniture and accessories, but they did everything from painting trim, to removing bifold doors, to taking loads of trash to the dump and more. 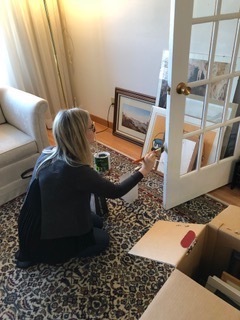 In this series of pictures you can see Linda herself doing the painting (Linda’s dad had been a painter, so she has no hesitation about grabbing a brush and doing touch ups). 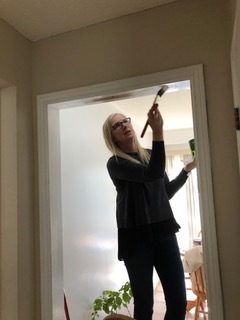 When the client saw Linda down on the floor painting doors and trim he was very pleasantly surprised. The client said: “We hired Linda because we loved her energy, but we never expected this. She does it all. And she never seems to stop.” Like many clients after Linda’s Team has staged their home, this one said “the house looks so great we really aren’t sure we want to sell it”. about doing the work. With a warehouse jammed with furniture and accessories, Linda and her team load up a truck (often making several trips) and they start doing the actual staging. This might seem like an obvious thing for realtors to do, but when most realtors offer a “staging service”, the burden falls on the homeowner, so that either the client will pay for a professional staging company, or the client will do the work. Not so with Linda. Linda takes on the whole job, and applies a ton of energy and determination to get it done. and Painting where needed, meaning trim, doors, darkened ceilings etc. 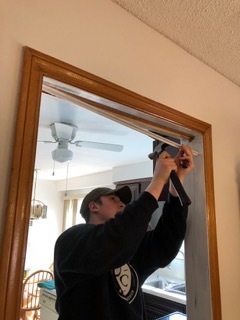 Removing bi-fold doors between the kitchen and other areas of the house so that the doorways and the home seemed more open, with better traffic flow. As Linda says, “At the end of the day, there is nothing more satisfying than seeing the smiles on the faces of the clients as they realize how much we have improved the appeal, and the saleability, of their home. We know how important this move is to our clients' personal goals, so its well worth our team’s efforts to push like this to get the job done”.